Every ritual and tradition of Hindu culture has a deep meaning to it. The article and things used during the puja ritual play a pivotal role in healing the body, mind and soul. During your visit to temples and puja ceremonies you must have witnessed ringing of the bell. Did you ever wonder why the bell is rung during puja rituals? 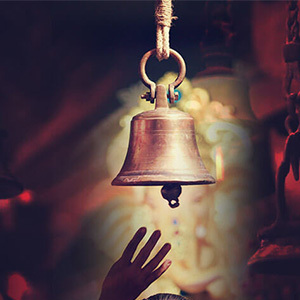 Bell, popularly known as Ghanta or ghanti in Sanskrit, is a vital part of Hindu pujas. Before worshipping the deities in temples and before beginning a puja ritual at home, we often ring the bell as a sign to invoke the Gods and Goddesses. Ringing the bell produces the divine sound ‘OM’, which produces positive frequencies and vibrations around the place. Bell plays an integral part in most of the puja ceremonies and is rung while bathing the idols of the deities, before commencing a puja, during aarti (chanting mantras and verses from holy scriptures while waving the diya(oil lamps)) and while making religious offerings to the deities. The bell is said to be the spiritual seat of Gods and Goddesses. It is believed to be the manifestation of all Gods and musical instruments, hence it should be played. 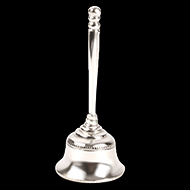 A wide range of magnificent bells that vary in design and shape like the Ganesh hanging bell, Garud bell. Nandi bell. Clamp bells (used during bhajans or jagrata), Tibetan Om bell etc are popular. The body of the bell illustrates infinity meaning Ananta in Sanskrit, while the tongue of the ghanti represents Goddess Saraswati. The handle of the bell represents Hanuman, Garuda, Nandi or Chakra and is considered to be the essential life energy known as Prana Shakti. As per Skandpuran, the sins committed by a man in this life and all past lives can be dissolved by ringing of temple bells. Let us now understand, how ringing of a bell can aid in spiritual growth and befit a person scientifically. The sharp sound that is produced by ringing the bell activates the seven chakras in your body. Creates harmony between the right and left lobes of the brain. Thus, creating unity between them. The sound is soothing to the ears and calms down the mind and soul. Thus making us feel relaxed and rejuvenated. Thus, the sound of the bell beholds immense healing properties that helps one to zone out of the worldly chaos and get into the state of trance and be one with the Divine. It is quite interesting to know that every article present in our puja ritual had such deep meaning attached to it. Who knew that the age old rituals that we follow even today had a scientific as well as spiritual benefit to it. We hope you liked this read. In order to unveil more secrets and the underlying significance of Hindu rituals stay tuned to this space. I was searching for Shiva Abhishek stand in USA since long and I didn’t find it. Then I came across the Rudra center and thought to give it a try... their service and quality of product is beyond my expectations and deliver it in just 2/3 Days. I am happy to know there are such genuine service provider exist in which you can trust blindly. I am surely a permanent customer of them now. I wish great success and growth to Rudra Centre. I received my parcel today. As usual, I loved them all. I was looking at my previous emails and I noticed that my first order was in 2010. You still provide amazing service. We ordered Copper Abhishek pot with Large plate on Saturday and it arrived by the following wednesday. The quickest service i ever got from a seller in India. The item came in such a package that there was no danger of the item getting destroyed. I finally found a seller who knows how to give customer satisfaction and i will definitely recommend and do more purchases in the future.